I love cooking, no matter how long the recipe takes, but sometimes we just don’t have the time or we’re too hangry to wait. When I got back from the gym today, I was ready to chew my arm off, so I looked in the pantry to see what I could make. 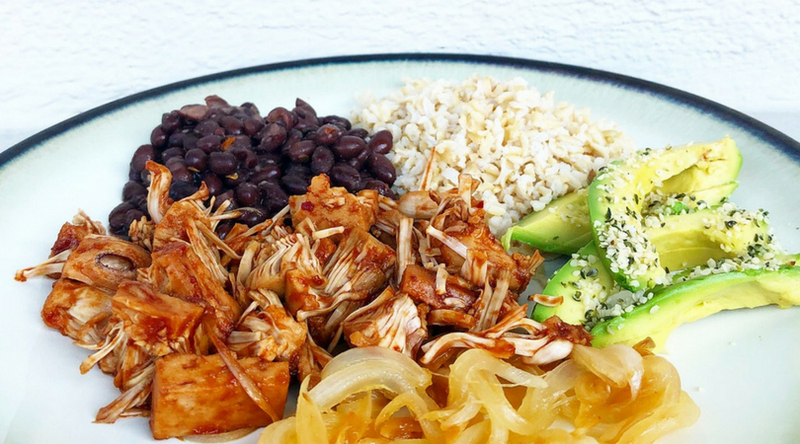 Of course, I always have a can of jackfruit and black beans. In the fridge, I had a Spanish onion, bbq sauce, and leftover brown rice. And, on the counter, was a perfectly ripe avocado. 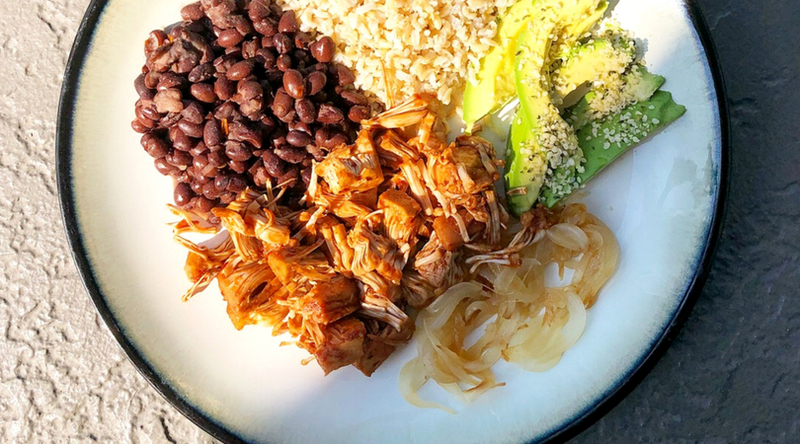 My brain was like “VEGAN BBQ, GIRL!” And that’s exactly what I did. It was ready in under 45 minutes and was SO GOOD. 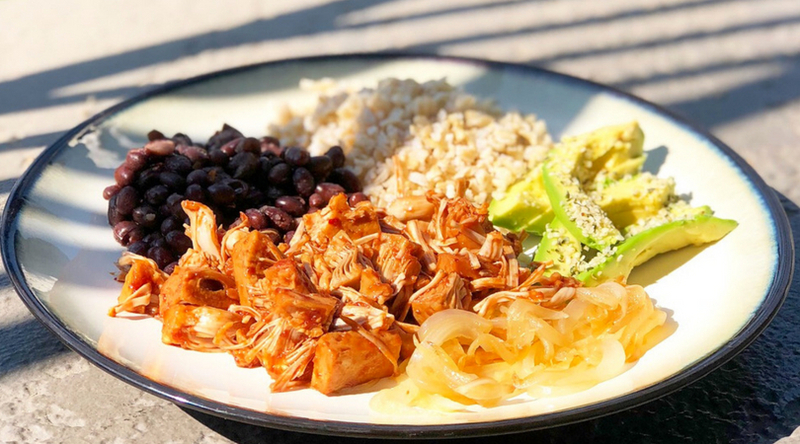 BBQ Jackfruit with Spicy Garlic Black Beans, caramelized onions, brown rice, and avocado sprinkled with hemp seeds. My recipe makes 2 servings and you’ll have leftover brown rice (which is always nice). 1. Drain, rinse, and boil the jackfruit for 15 minutes. Drain water, toss in BBQ sauce, lay on a cookie sheet and bake at 400 degrees for 15 minutes. Remove from oven, add more sauce, and shred with a fork. 2. In a dry frying pan on low heat, sprinkle some salt on the onion slices. When they start to sizzle, toss lightly with a wooden spoon and cover for 15-20 minutes. If onions start to stick or burn, add 1 TBSP water, toss and recover. 3. Boil your black beans with a pinch of salt, garlic powder, and red pepper flakes to taste. Allow to boil for 10 minutes, then strain. 4. For the rice, bring 2 cups of water to a rapid boil before you put the rice in. Allow to boil for 10 minutes and then cover on simmer for 20 minutes. Fluff with a fork when done!